The King of Las Vegas and America’s premier sports gambler reveals a powerful program for breaking all the rules, beating all the odds, and achieving all your dreams. 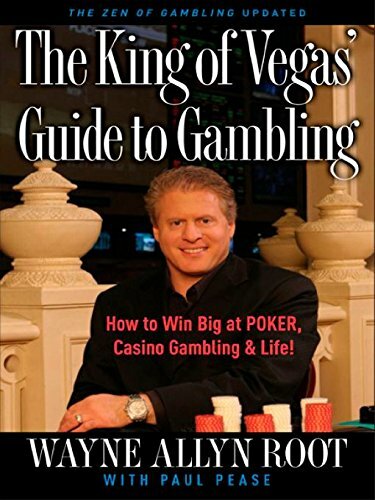 In The King of Vegas’ Guide to Gambling, Wayne Allyn Root of Spike TV’s King of Vegas (TM) demonstrates why it is vital to take risks in life—whether in the casino, on the playing field, or in the boardroom. Root lives an American dream: He makes money watching sports on television. In fact, as CEO of GWIN Inc., America’s only publicly traded sports-handicapping firm, Root is a self-made millionaire with hundreds of thousands of sports-betting clients and fans. In this book, he reveals the spiritual principles behind his consistently winning hand. Turning the popular conception of the casino denizen on its head, Root shows readers how to concentrate on the risks they take and to cultivate tranquillity in the face of life-defining, stressful moments. Bringing a unique contrarian approach to gambling, Wayne Allyn Root states his maxim of never following the masses and always taking the lead in life, and guides the way to navigate successfully the many gambles life offers.